One Pot Wonders – Mama, Can I Lick the Spoon? On St. Patrick’s Day, I make Irish stew and potato pancakes. On Cinco de Mayo, I make fajitas and enchiladas. Dr. Seuss’s Birthday? Yep. I make green eggs and ham. In Louisiana, we celebrate Mardi Gras. Mardi Gras is French for Fat Tuesday. It’s a day of feast before the sacrificial season of Lent begins. I always try to make some sort of Louisiana-themed food. This year, I chose to make this beautiful pot of heaven. Oh, man. I could write songs about shrimp. I love the texture. I love the taste. I especially love how easily and quickly it cooks. 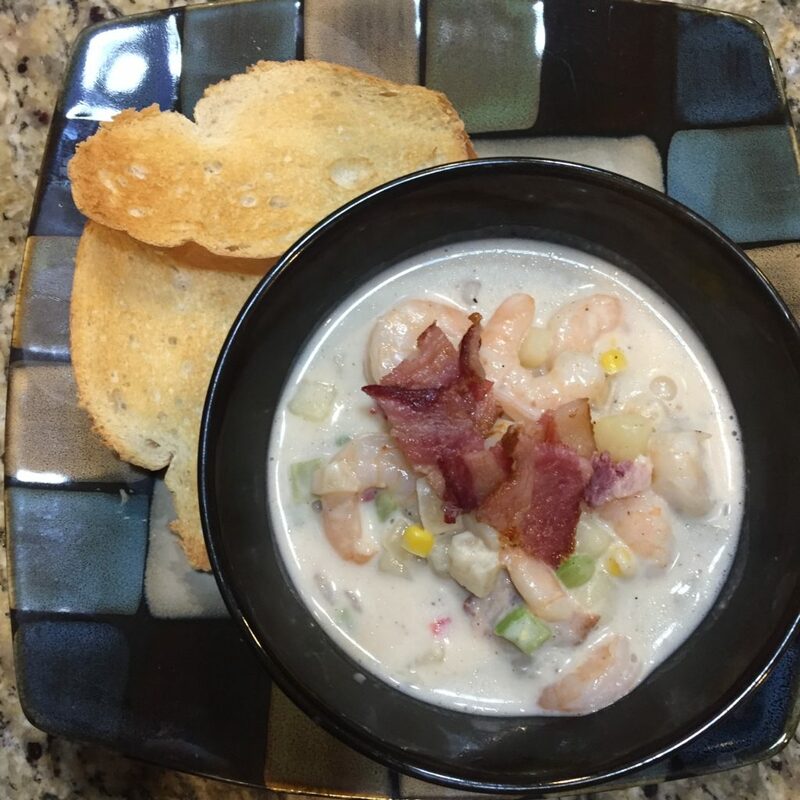 Our schools were out for Mardi Gras, so I had time to really enjoy cooking (and eating) this soup. It really didn’t take that long to cook, but it’s nice to be able to cook a meal without rushing at the end of the day! And my tribe? They were all on board with this one! Add butter to a large pot or Dutch oven and let it melt. Add the onions and cook, stirring occasionally, until onions are translucent, then stir in the garlic, salt, and pepper. Cook until garlic is fragrant – about 1 minute. Sprinkle the flour over the top of the onion and garlic mixture, then cook, stirring constantly, for 1 minute. Slowly pour in the milk – one cup at a time – whisking after each addition and waiting until it thickens before adding the next cup. Add the corn, potatoes, and cayenne and stir until mixture begins to boil. Let it bubble until thickened – about 5-10 minutes. Stir in shrimp and continue cooking just until the shrimp are pink and curled. Remove from heat and stir in the half and half. Serve hot, topped with bacon. Well Duh #1: I actually used 36 ounces of shrimp because the bags I bought were 12-ounce bags and not 1-pound bags. Always err to the side of more shrimp! Well Duh #2: Don’t get in a hurry and add all the milk at once. 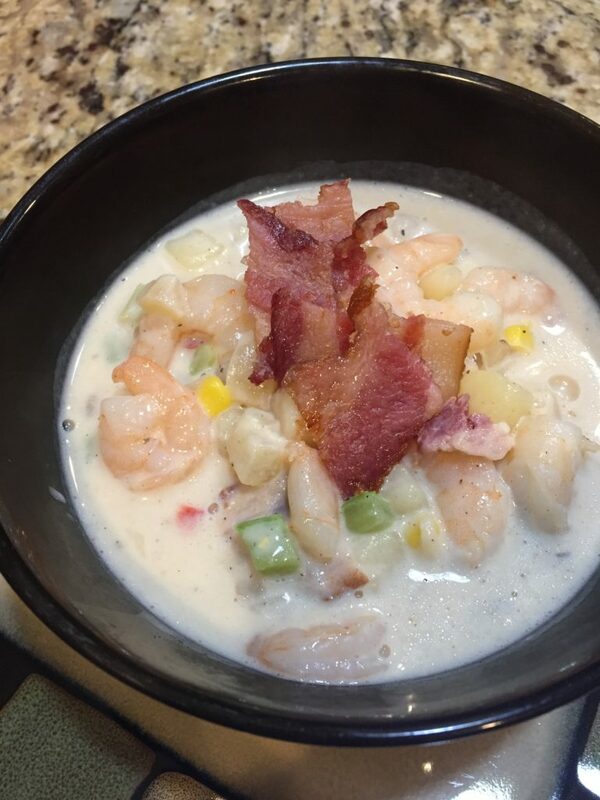 This will result in a thinner chowder. Well Duh #3: Taste and add more salt as needed. You can also add more cayenne, but do so in 1/4 teaspoon increments. You can always add more. Once it’s in there, you can’t take it out. Well Duh #4: If you are still in need of a little extra spice, you can always add a little hot sauce to your bowl. Michael did this to his. Well Duh #5: I accidentally grabbed a bag of seasoning blend (onions, bell pepper, and celery) instead of chopped onions from my freezer. I didn’t realize it until I had already poured it in. It was absolutely fine! No worries! Well Duh #6: I cooked my bacon in the oven. I line a baking sheet with foil or parchment and lay out the strips of bacon. Bake at 400 degrees for 20-25 minutes – or until bacon is crisp. Mine took a little longer because it was thick-cut bacon. Remove slices to paper towels to drain excess grease. It was a cold day when I made this and we were all in need of something warm. Christopher doesn’t even like soup, but he ate two bowls of it when he came home from work. Probably has something to do with the shrimp! Warm, hearty, creamy, and delicious. This one was definitely tribe-approved!